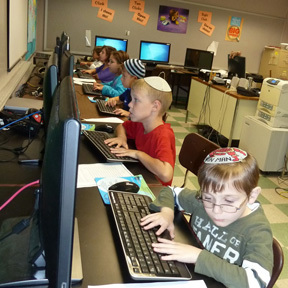 The goal of the computer technology program is to provide students with computer skills to design, create, communicate and solve problems by integrating the use of computers within the General and Judaic Studies curricula. Computer classes are taught by a technology specialist who also works with students and teachers to ensure that technology is used to augment and strengthen the General and Judaic Studies curricula. 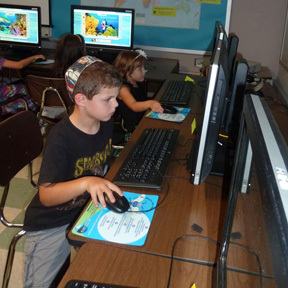 Students learn to use a variety of software to reinforce concepts learned in Math, Language Arts, Social Studies, Judaics and Science. They are instructed in grade appropriate graphics and software, in the proper care and use of computer hardware and software, and in the proper use of Internet search tools. 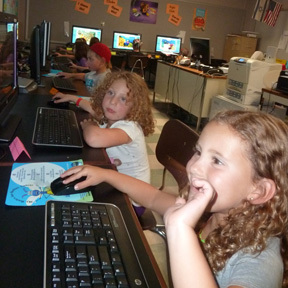 The importance of Internet safety is emphasized at all grade levels. 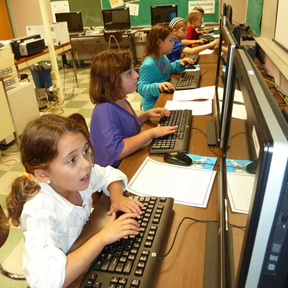 Keyboarding and word processing are taught so that students develop skills that will enable them to improve their creative and expository writing at all levels. A web design club meets to explore the techniques for constructing and styling web pages. In the upper grades, students prepare multi-media projects combining graphics, video, Powerpoint, photography and music.